It always takes me a while to get in the spirit of Christmas. I usually don't feel festive until December 21. No matter how many lights or decorations, bars of songs or sequined dresses come my way, I never get into the mood until the 21st. Since that's when the world is supposed to end this year, I feel right on track. There are only a few traditions that take place every year, without fail, at my house: Christmas cookies, ham and lamb for Christmas dinner, gingerbread and pineapple upside-down cake. Every Christmas, me and my grandma would make a pineapple upside-down cake. We'd also make a carrot cake (chock-full of raisins, pecans and crowned with cream cheese frosting) but it was really all about the pineapple. 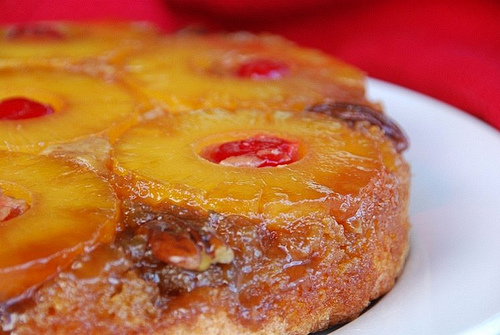 Fresh, canned, jarred, sliced OR crushed, decorated with maraschino cherries, the pineapple upside-down cake is a thing of beauty. Buttery, yellow cake with hints of salt and dark, caramelly edges, softened with roasted pineapple rings and chewy, sweet cherries, the taste of this cake takes me back to being a child. Always made in grandma's cast-iron skillet, it is always suspenseful to see if the cake will turn out intact or if a portion of the caramelized pineapple will stick to the bottom when flipped over after baking. Scroll below the recipe and watch a video of my mom flip our holiday cake onto a cake plate... or does it make it? In a 10-inch cast-iron skillet, melt 1/4 cup butter with 1 tablespoon of water and add brown sugar. Stir well with a wooden spoon over medium heat until the sugar is completely dissolved and the caramel is smooth. Arrange pineapple rings evenly in the caramel. Place 1 maraschino cherry in the center of each pineapple ring. Make the cake: Sift flour and baking powder together. With a hand mixer or In a stand mixer fitted with a paddle attachment, cream butter and granulated sugar until light and fluffy. With mixer on low, add eggs 1 at a time and mix until each is incorporated. Add buttermilk and then flour. Mix until incorporated. Alternatively, in a small bowl or large measuring cup, measure the buttermilk and add the vanilla and eggs. Add half of the buttermilk-vanilla-egg mixture then half the flour. Repeat. Pour the batter into the skillet over the caramel and pineapple rings. Place pan in the preheated oven and let cake bake for about 40 minutes. The cake should be nice and golden on top and puffed up slightly. Allow to cool slightly, (about 20 minutes), before inverting onto a cake plate. The cake looks delicious!!! Thanks for sharing the recipe. Pinterest has put me in the Christmas Spirit - I have repinned more stuff in the last 2-3 weeks than I have in the last 2-3 months. Love it! Merry Christmas!!! You're welcome! Maybe I should go to Pinterest to put some legs on my bah-humbug and get me in the Christmas spirit! Ok, Susan has asked me to make this for her soon. I will document it, and let you know how it turns out! Merry Christmas! Please do! I'll be asking about it, haha. Merry Christmas to you, too! I absolutely love pineapple upside down cake! My mom made it for me when I was a kid, and it was always delicious. I will definitely try your recipe. Thanks for sharing!